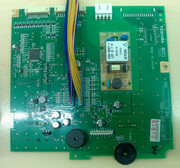 Is there a possibility to attach this lcd display to pc to work with lcdinfo ? Looks like you have the working hardware there available that drives the display in that one picture ? Do you have an oscilloscope available to check the signals ? That way you should be able to find out the signals from the working equipment. Your display should use signals that are something similar. Then the power supply and VEE voltages you can measure with a multimeter.